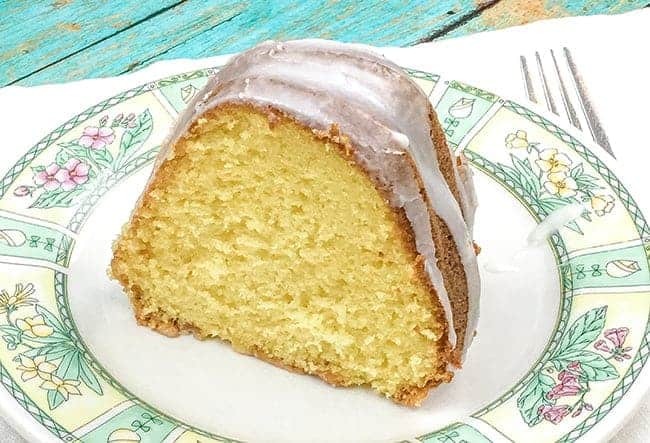 This classic apricot nectar cake recipe uses a yellow cake mix, although some people may like to use a lemon cake mix. 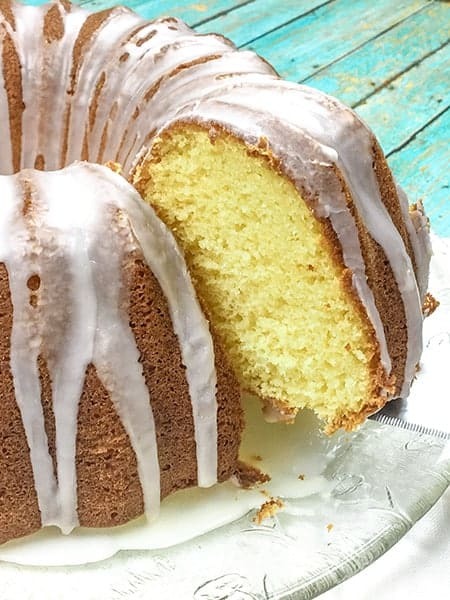 This is mom’s recipe so I’ve always used the yellow cake mix. This recipe also calls for sour cream and real butter. 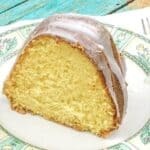 Sour cream makes this cake super moist and the real butter add a rich buttery flavor and adds to the moisture as well. Simply place all the ingredients into a large mixing bowl and mix well for a couple of minutes. Then pour the batter into a greased and floured (I use baker’s joy to grease and flour my cake pans) bundt pan or tube pan. This is my favorite bundt pan. The handles come in handy when you’re flipping the cake out of the pan to cool. Bake at 350 for about 40 minutes. After the cake cools you can add a glaze if you wish. It’s not necessary as this cake is delicious as is, but I think the glaze makes it really pretty and extra tasty. I recently made this cake then my husband took it to his office. It didn’t last long and several people told him it was delicious! So next time you’re needing an easy, delicious cake to take to an office function or for a family gathering, this cake is a winner! Apricot nectar cake has been around for a long time, so I was glad to find my mom’s recipe and share it with you. It’s hand-written by her on a recipe card so it’s sentimental as well. 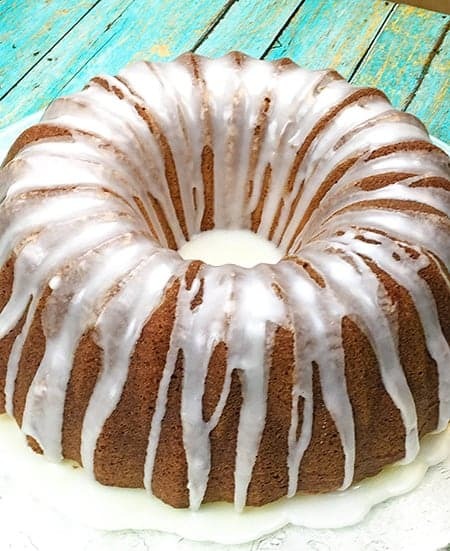 Old fashioned apricot nectar pound cake is an easy, delicious, moist cake made with apricot nectar, sour cream, and real butter topped with a simple glaze. Add all ingredients to a large bowl and mix well for 1 minute. Scrape down sides of bowl and mix for another 2 minutes. Bake for about 40 minutes. Check for doneness with a toothpick. (Insert toothpick into cake, if it comes out clean, with no batter stuck to it, then the cake is ready). Cook cake in the pan for 15 minutes. Then, transfer cake to a wire rack to completely cool. If desired, add a simple glaze of 2 cups confectioners sugar and 2-4 tablespoons of water, lemon juice, or apricot nectar. Note: it may take more liquid to get the desired consistency for the glaze. The glaze should flow smoothly; not too thin and not too thick. I like to compare to the consistency of honey. If you try this cake and like it, please let me know by leaving me a comment. I’d love to hear from you. This cake looks so amazing! It seems like something I could take on and not totally mess up. I think I will use the lemon cake mix you suggested! Thank Shannon! Yes, the lemon cake mix bodes so well with the apricot nectar. Give this recipe a try. It’s easy! Wish I had a slice of it now! This was the best cake I’ve ever made!!!! Everybody loved it! Can’t wait to make it again.